• ISOCITRATE (ISOCITRIC ACID) is a substrate in the citric acid (TCA) cycle. 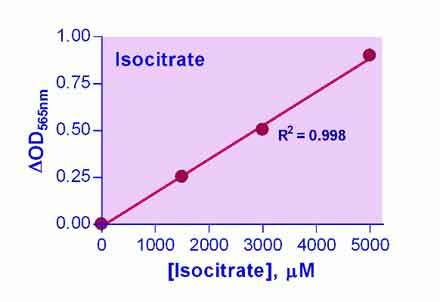 Isocitrate is formed by the isomerization of citrate catalyzed by the enzyme aconitase. Isocitrate is oxidized by isocitrate dehydrogenase producing α-ketoglutarate and generating NADPH. Isocitrate is commonly found in many fruits and vegetables and their processed products. Industrially, isocitrate is used as a marker to identify the quality and purity of fruit juices. BioAssay Systems? isocitrate assay measures the NADPH generated from the oxidation of isocitrate. The NADPH converts the dye to an intense violet color with an absorption maximum at 565 nm. The increase in absorbance at 565 nm is directly proportional to the isocitrate concentration.